The Cudahy Depot was built in the early 1890s to serve the Chicago and Northwestern Railway in the area then known as Buckhorn. The passenger depot was the site of many family reunions when newly arrived immigrants joined relatives already settled in Milwaukee County. In 1912, the depot was expanded in size to handle freight as well as passengers. Originally, the Patrick Cudahy family owned the land and gave it to the Chicago and Northwestern Railway for development of a depot but still retained an interest in the land. Passenger service to the depot ceased in 1940 although freight shipping continued. In the early 1970s, the City of Cudahy condemned the depot, and it was slated for demolition. However, the Cudahy Historical Society proposed to keep the depot at its original location as a historical landmark. An ensuing petition drive to save it from being razed persuaded the city council to reverse the condemnation order. Several years later the Cudahy family gave the land immediately surrounding the depot to the Cudahy Historical Society along with the land title and deed. Since then, restoration efforts have been conducted by the Society and other interested community groups and businesses through voluntary labor and donations using items salvaged from buildings of the same period. The depot’s original colored glass squares surrounding the windows remain, as does the wide oak planking on the floor. 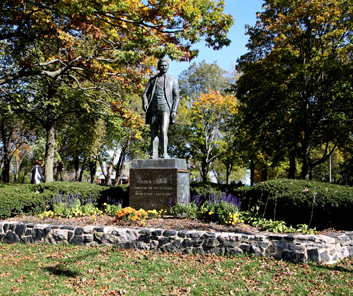 Immigrant Park and a statue, “New Life,” were created to celebrate the community’s centennial. This home played an important role in the development of the City of Cudahy and its meat-packing industry. It is one of only a handful of 19th century homes in Cudahy to have survived without major exterior changes. It was built in 1892 and displays characteristics of both Colonial Revival and Queen Anne architectural styles. Its façade is dominated by the large wrap-around porch and two unusual barrel-vault dormers. The siding material is the original pine clapboards in two different widths, and shingles on the second story. The original iron railing on the porch has been retained. The foundation is built of cream-colored bricks which had been glazed and fired to provide an orange color and greater durability. The house was built without electricity, plumbing or central heat. One of the dormers was added in the first decade of the 20th century to accommodate indoor plumbing. At that time, central hot water heat and electrical wiring was installed. The double parlor and dining rooms feature original decorative plasterwork and an attractive tiled fireplace. In 1892, Patrick Cudahy purchased a parcel of over 700 acres of land in the town of Buckhorn (now Cudahy). He chose this spot because of its easy access to the Chicago and Northwestern rail line and because it was the highest spot along the Lake Michigan shoreline between Milwaukee and Chicago. It was Patrick Cudahy’s intention to build a meat-packing plant on this land to compete with the aging Plankinton meat-packing plant along the Milwaukee River. Workers were needed to support this plant, and the workers needed homes. Patrick Cudahy employed Henry C. Schade as his land agent and developer to have the 700 acres platted, sold and developed. Land sales were conducted from the front porch of the home. As the City of Cudahy grew, young, single women who came to teach in its schools, found a place to live in the Schade home. The home also served as a church for a year. In 1927, St. Mark’s Evangelical Lutheran Church was newly established but had no place to meet for services. During the winter of 1927-28, the house was the meeting place for the congregation. This was the grandest home in Cudahy, a meat-packer’s town of modest homes. Most of the other homes have been altered considerably, but this home stands as a living connection to that time. In 1911, Patrick Cudahy’s family donated forty acres of land on the bluff overlooking Lake Michigan — previously the site of the famous meatpacker’s summer home — to the City of Cudahy for use as a park. 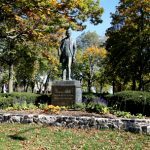 Originally named Cudahy Park in honor of the donor, the park was renamed in for Civil War hero Phillip Sheridan in 1920. Eleven years later, Sheridan Park became part of the Milwaukee County Park System. During the Great Depression, laborers from the Works Progress Administration constructed a swimming pool and bathhouse in Sheridan Park, and the park hosted a WPA Toy Loan Center and WPA outdoor theatrical performances. Several years later, workers from the Civilian Conservation Corps constructed jetties in Lake Michigan off Sheridan Park as well as a service road down the face of the bluff. Following World War II, Sheridan Park was the location of a trailer park intended to provide housing for returning veterans. The property is honored for its historic significance. In 1911, Patrick Cudahy’s family donated forty acres of land on the bluff overlooking Lake Michigan — previously the site of the famous meatpacker’s summer home — to the City of Cudahy for use as a park. Originally named Cudahy Park in honor of the donor, the park was renamed for Civil War hero Phillip Sheridan in 1920. Eleven years later, Sheridan Park became part of the Milwaukee County Park System. During the Great Depression, laborers from the Works Progress Administration constructed a swimming pool and bathhouse in Sheridan Park, and the park hosted a WPA Toy Loan Center and WPA outdoor theatrical performances. Several years later, workers from the Civilian Conservation Corps constructed jetties in Lake Michigan off Sheridan Park as well as a service road down the face of the bluff. Following World War II, Sheridan Park was the location of a trailer park intended to provide housing for returning veterans. The property is honored for its historic significance.